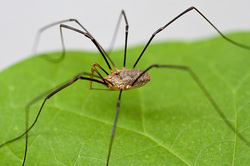 Harvestmen, commonly referred to in Virginia as "Daddy Longlegs", are not true spiders. They have one flat rounded body part with 8 very long legs attached. Harvestmen live outdoors in trees, shrubs and other foliage and like to eat other insects. They are not harmful to humans, although they tend to congregate in large numbers during the fall season. To learn about the Jumping Spider, click here!